I learned how to drive in a Volkswagen Kombi/Combi van, just like this one! My Dad had infinite patience, and there were tears over the hill starts, but I got the hang of it, and now I can drive anything. 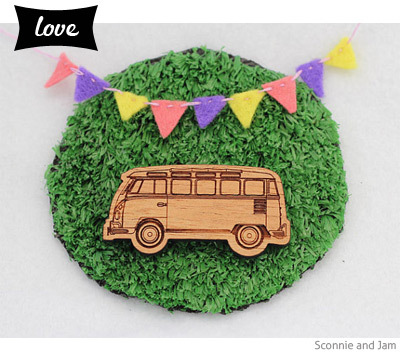 So this super-cute Kombi brooch from Sconnie and Jam is just my style. Oh man the old kombi! My partner had one and I remember never being able to reverse it so i had to park it in 'drive forward to get out' spaces only!! And then trying to climb in and out of it when pregnant - a total nightmare!! Ooo ... what a lovely brooch. My son-in-law inherited his family's Kombi. It's his prize possession and it's done well over a million miles (yes, they had miles back when he was a boy). If that Kombi and I were caught in a life and death situation and he could only rescue one of us, I wouldn't like my chances of survival! @Hot Fudge - how great is the Kombi. I bet your son-in-law's Kombi is handed down to his kids too. Even if it's just a cubby house, it is such a design classic.